After years of looking for a local provider, I finally had a Breast Thermography done at MDITI by HealthQuest. 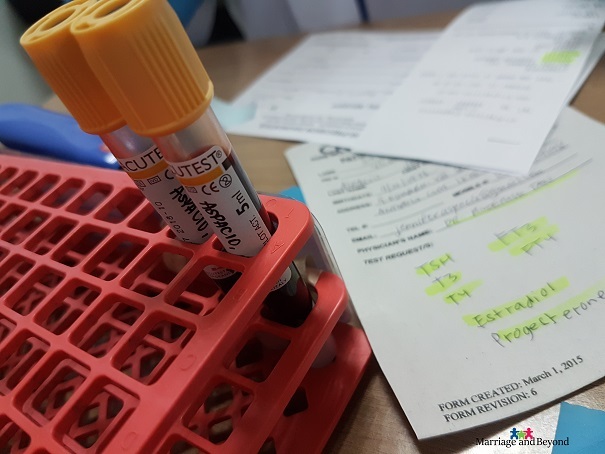 My journey towards becoming the bio-hacker that I now profess to be jump started when I realized that I can no longer keep on saying yes to a medical procedure without full knowledge of what I was getting getting myself into. I was 19 years old when I underwent a lumpectomy where a benign fibroadenoma was excised off my left breast. I knew so little about reading up on breast diseases, that I just went with what my folks, who also did not know better but trust the doctors. All I knew was that it is in our history, and I was downright scared. I was in college back then and the first doctor who I saw was from University of Santo Tomas, where I was taking my college degree. He was convinced that I should have a mastectomy, then do a reconstructive surgery straight away, without a cancer diagnosis at that. I don’t know about you, but that sounds a whole lot like we were taken for a clueless milking cow, who don’t know any better. I am grateful that we had a second opinion at the old Polymedic Hospital (now Victor Potenciano Medical Center). I had the excision done without having to undergo mastectomy. With a history of my maternal grandmother who has died of breast cancer at a young age of 52, I have since received words from doctors I’ve seen that it is “now due” to happen, since cancers usually skip a generation – even going through the lengths of asking how my cousins are doing heath-wise. It has been 23 years since I was first told I was a candidate for mastectomy, and for someone who was kind of psyched into believing growing up that cancer runs in the family, that was beyond traumatic. We continue to pray against this perceived generational disease. As backed it is by science, I refuse to receive this as absolute truth. While the cancer may have run in my maternal blood line, my resolve has since transitioned to holding on to the Lord’s sovereignty and ability to redeem and heal. 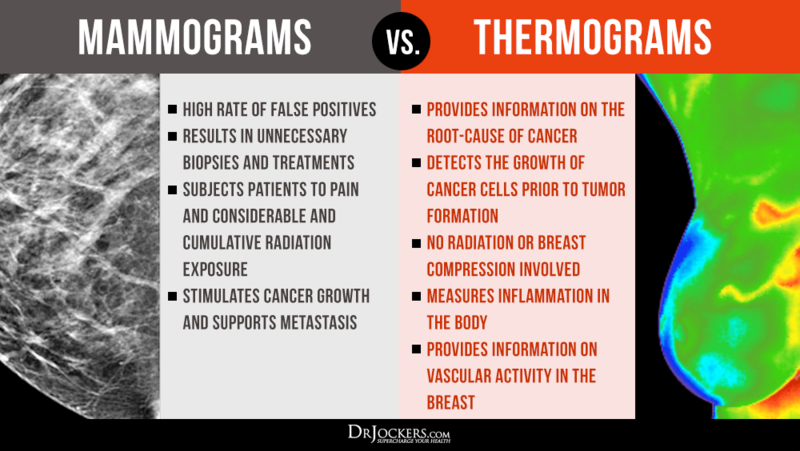 It was through The Truth About Cancer where I first heard about Thermography as the better, and non-radiation alternative to mammography, and I was all ears. And for someone who was asked to have a mammography done when I was in my early twenties, nary a cancer diagnsosis, even doctors I have seen these recent years echo my thoughts that I should not have been subjected to one at such an early age, especially since the excised fibroadenoma was benign. 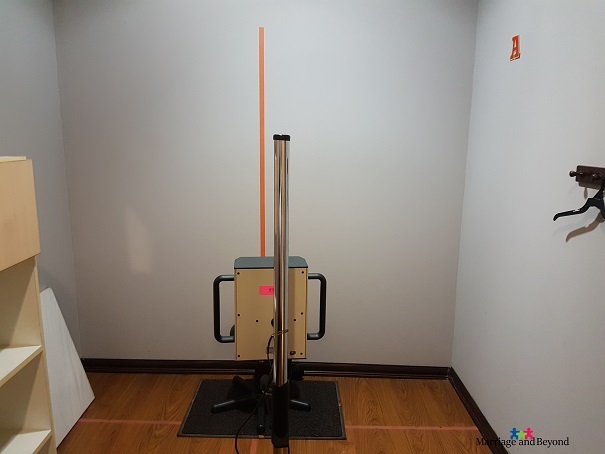 I began searching for a clinic that offers Thermography, even as I also get questions from readers via our Facebook page, whenever I share info on mammography vs. thermography. The use of Digital Infrared Imaging is based on the principle that metabolic activity and vascular circulation in both pre-cancerous tissue and the area surrounding a developing breast cancer is almost always higher than in normal breast tissue. In an ever-increasing need for nutrients, cancerous tumors increase circulation to their cells by holding open existing blood vessels, opening dormant vessels, and creating new ones (neoangiogenesis). This process frequently results in an increase in regional surface temperatures of the breast. Cancer cells need blood vessels to feed, and would grow NEW blood vessels as survival mechanism to feed its higher nutritional and metabolic needs. With more blood vessels supplying nutrients, extra blood flow increases heat level of the affected area. 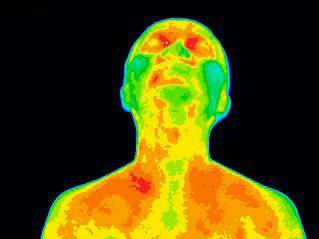 Thermography detects this phenomenon using sensitive infrared cameras designed for medical applications. The formation, growth and development of breast cancer at its earliest stage can now be effectively screened, monitored and tracked! Aside from naturopathic doctors Dr. Mercola and Dr. Axe, who I have been following for a while now, Dr. Jockers is also an authority in this department. I especially love that Dr. Jockers is a God-fearing physician, chiropractor, whose advocacy I totally support. He has prepared for us these visuals that gives us a general idea of the difference between mammograms and thermograms. Thermal imaging has the ability to pick up abnormal blood supply well before cancer cells multiply enough to be detected as a lump in a routine breast exam. 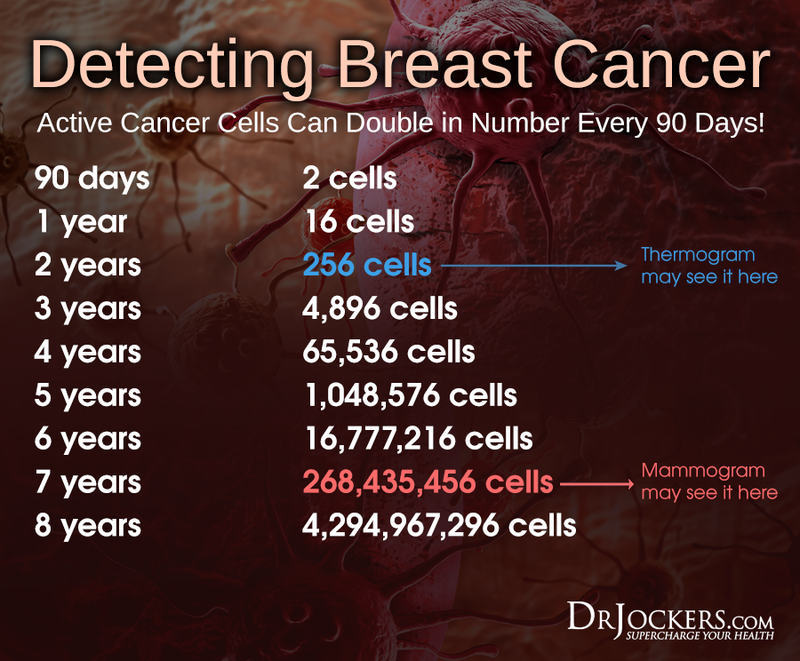 Thermography can detect cancer approximately 10 years before mammography will be able to. As much as I love these naturopathic doctors and follow them alongside other bio-hackers I look up to, I am not in a geographic possibility to be able to see them for a consult. So when I had my breast ultrasound done last August and I was told by the doctor that it detected 15 nodules (masses and cysts) altogether in both breasts, and a mammo should be done right away, I knew I had to look for a local thermography provider. I was set to find a local provider of thermography. 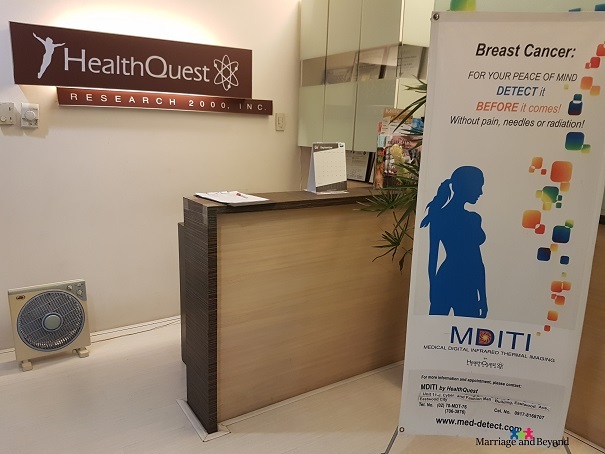 MDITI (Medical Digital Infrared Thermal Imaging) HealthQuest is located in Unit 11-J, 11/F CyberMall Building, Eastwood City, C5 Libis, Quezon City. Presiding naturopathic doctor of MDITI HealthQuest is Dr. Roderick Tan. 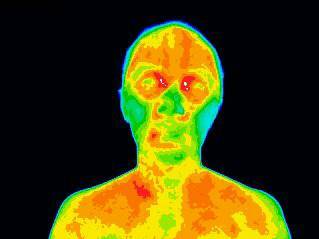 Dr. Tan has been practicing thermography imaging for over 15 years. Unlike other local providers of thermography who send the captured thermal image to the United States to have them read and interpreted, leaving patients hanging for approximately 5 days till they get hold of their results, Dr. Tan has devised a system where a patient makes efficient use of his/her time by making results available after the scan. This makes a lot of sense for us city-dwellers, to have the result in one go. Aside from getting hold of the thermal images, the consult and protocol are discussed straight away. Talk about having a productive doctor’s visit. This is why he asks for patients to give each visit 1 to 2 hours, to make sure to leave no stone unturned. 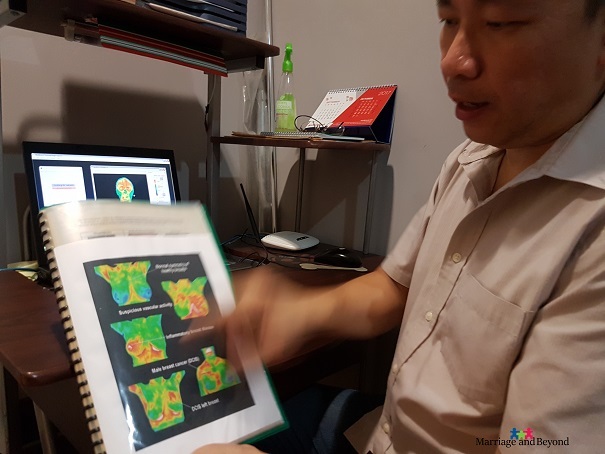 It was a blessing to have found the best local thermography expert in Manila, with a clinic that’s at the heart of Quezon City. Don’t drink hot drinks or eat spicy foods up to 2 hours before the scheduled screening. Wear cool and loose clothing. Don’t apply lotion or perfume on the areas to be screened. If comfortable and willing, don’t wear any type of brassiere. Just bring it and wear after the procedure. No exercise any time before the screening. No massage if doing a full body screen. Give enough time to cool down upon arriving at the clinic. The Thermography procedure itself was quick. After disrobing from the waist up, a female technician, who happens to be the wife of Dr. Tan took the thermal images of my upper body, in at least 10 different views. These are three from the ten thermal images that the husband approved for me to publish. 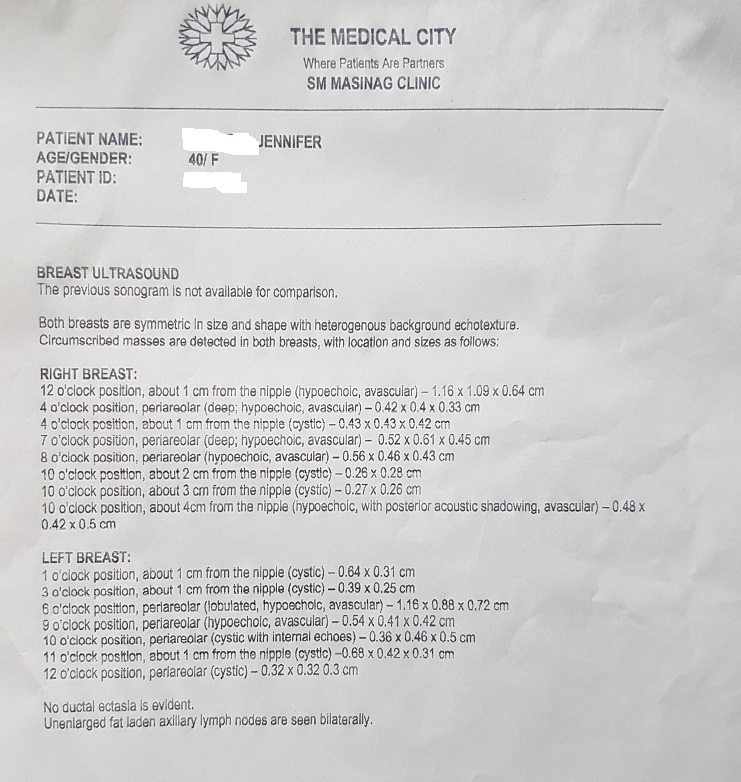 One of the first things that Dr. Tan noticed was how the heat patterns from the breast nodules that need monitoring traces up to my throat and mouth. It was amazing to me that without my telling him beforehand that I had a root canal treated tooth on one of my left molars, and a perennially problematic wisdom tooth on the right. Dr. Tan further asked me when I had the root canal done, I said it was in 1993 or 1994. He then followed it up with another question, when I had the lumpectomy procedure done, it was in 1995. I remember reading about the connection of root canal and cancer in an article by Dr. Mercola. It was mentioned that there was a five-year study of 300 breast cancer patients that 93 percent of them had root canals. There were several “hot” portions, but Dr. Tan showed us an area that specifically needs close monitoring. The color “white” being the hottest in the thermal image color scale, that is pretty easy to spot in the above photo. Dr. Tan emphasized that this might just be a part of my make up, more like a “thumb print,” but it may also be cancer cells brewing. He further explains since this was my first scan, this will serve as a base line. I will have to check back and have the scan done again after three months. *Please note that the head scan is a separate procedure from that of the breast scan/thermography. Depending on the patient’s health issue, a “region of interest” scan is recommended to trace the root of the problem. In my case, the problem is traced up to my throat and mouth area. Dr. Tan explaining what a normal, cancer-free scan looks like. It was downright important for me that I will not just do nothing and wait out the three months to pass. After explaining my thermal scan reading, Dr. Tan enumerated the protocol that I can choose to follow. 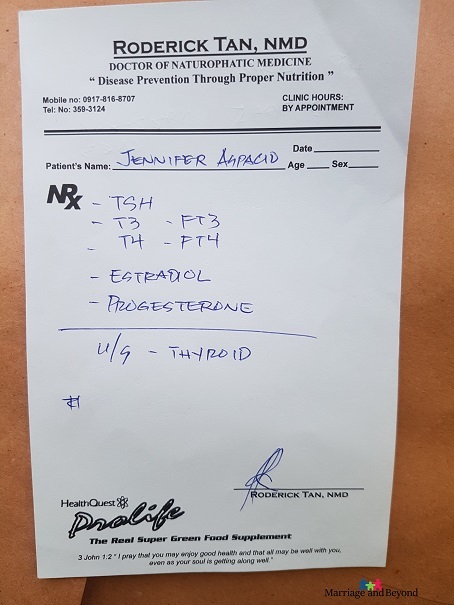 First off, Dr. Tan had me do the follow lab tests: Thyroid panel tests, to check for my estrogen to progesterone ratio. He also recommended for me to go back to oil-pulling (the violent swishing of VCO inside the mouth first thing in the morning). I’ve been doing this for years, I used to do it for 20 minutes. But doc said since we have to address the chronic infection coming from the RCT, I have to do oil-pulling twice. It was such a comfort and blessing to finally find a doctor that speaks my language! I went to Hi-Precision Diagnostics right after the consult. I haven’t had the thyroid ultrasound done yet. That’s next. Another thing Dr. Tan asked for me to do was to do a Food Journal. You read that right. Apparently, food journaling is not limited to people who are trying to lose weight. If we come to think of it, it may as well be related to a quote by Hippocrates, “Let food by thy medicine and medicine be thy food.” More often than not, health anomalies are traced back to what we take in. This is why lifestyle diseases are taking up a huge chunk of what’s killing people nowadays. While this post may look lengthy as it is, I know there are a whole lot of things I still need to get done. I plan to document as I go along. Now that I think about it, I am grateful that the Lord led me to choose living healthy (considerably). I started kicking soda off my system around the same time that I had my surgery – at around 19 years old. It was a gradual turn for me, influencing my family toward healthy living. Going organic, Oil pulling, getting off pork, dry brushing, switching from commercial pads to bamboo charcoal cloth menstrual pads three years ago, these things, they add up. And who knows, these choices might have just extended my lease on life one way or another. I am deeply grateful for the peace that truly passes all understanding that Jesus has gifted me with. This new episode of cancer scare will not budge my faith. Truth be told, I can only be so thrilled to finally see Jesus face to face when that time comes. But then again, I will continue to pray and speak healing in Jesus’ name, even as I cannot anymore count the miracles in my life that my Abba Father has allowed for me to witness. One of which is that Thyroiditis autoimmune disease I was diagnosed with in 2013. I was cleared of it late the same year, even my doctors back then made mention that it is one of the things that they have no explanation for. The cancer genes in my system may be prove to be stubborn, but I have a God whose will for my life will stand firm in all life’s stubbornness and brokenness. “The thief comes only to steal and kill and destroy. I came that they may have life and have it abundantly.” John 10:10. This health scare will not rob me of my joy. I will move forward as Jesus leads, and as I continue to hold fast in the Father’s promise that His plans is to give me a future and a hope. I cannot emphasize how thankful I am that we have found MDITI HealthQuest to partner with in this health journey. I used to feel frustrated over the fact that back here in the third-world, we are left to put up with traditional, health protocols that will eventually kills us quicker. The billion dollar pharma industries are benefiting, while people are withheld from alternative means that are actually life-giving. If you have health concerns, whether it’s breast nodule, or overall health for that matter, we highly recommend Naturopathic Doctor Roderick Tan. Dr. Tan has a long line of patients, some of them even fly from other countries. Please make sure to note that visits are strictly by appointment. Exclusive to MarriageAndBeyond.com readers, MDITI by HealthQuest is offering their Thermography services at discounted rates. 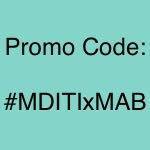 Please make sure to inform MDITI by HealthQuest upon appointment that you are availing of the Promo Code: #MDITIxMAB Promo Period: Feb 14 to May 30, 2018.